Muslims shed all signs of their wealth and societal distinctions by donning simple white garments, commonly called ihram. 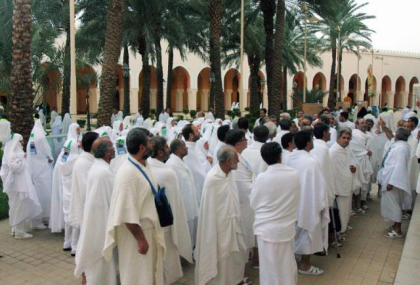 The ihram is a symbol of purity and equality, and signifies that the pilgrim is in a state of devotion. 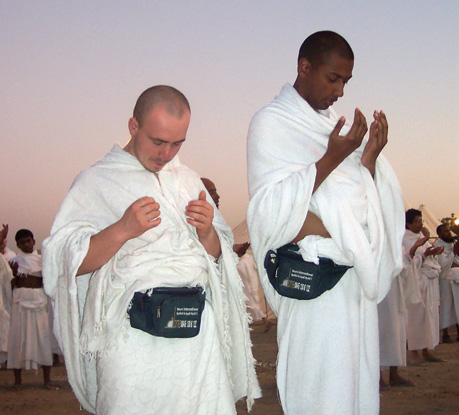 When undertaking the pilgrimage, the required pilgrimage dress for men is two white cloths, one of which covers the body from the waist down, and one that is gathered around the shoulder. Women usually wear a simple white dress and headscarf, or their own native dress. While wearing ihram, there are other requirements that Muslims follow in order to focus their energy on spiritual devotion. Harming any living thing is forbidden -- no hunting, fighting, or vulgar language is permitted. Vanity is discouraged, and Muslims approach pilgrimage in as natural a state as possible: excessive perfumes and colognes are not used; hair and fingernails are left in their natural state without trimming or cutting.